Ringless one is complete by robo-dialer and one of the most annoying spam methods. First one is an instrument for sales people across the world to be more productive and profitable.. But, What Exactly Is Voicemail Drop? Voicemail drop is a feature that allows your agents to save time when leaving voicemails on outbound calls. This feature was created after it was found out that the majority of sales agents constantly kept repeating the same messages to multiple customer’s voicemails. And indeed there was, in the form of voicemail drop. Voicemail Drop helps to solve this issue by allowing agents to leave personalized pre-recorded voicemail messages with ease using Cloud Phone solutions such as Nectar Desk. What Is Nectar Desk’s Voicemail Drop? Nectar Desk’s Voicemail Drop is a user-friendly yet powerful customer engagement instrument. It allows you to create custom messages using your own voice and delivers them directly to your customer’s voicemail in an extremely cost-effective manner. Your customers can now receive updates, notifications among other important information. Does data on Voicemail drop exist? Fortunately, it does. 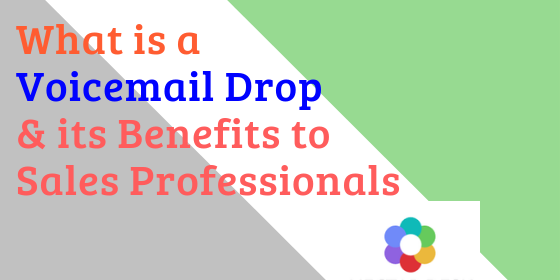 According to drop.co there is a considerable amount of data that outlines the importance of Voicemail drops. Its’ reported that over 87% of sales calls never reach a live answer. This represents one of the inconveniences of selling over the phone. This and many other reasons have made many savvy sales professionals opt to use dialer software applications with voicemail drop features. Here’s the deal: Voicemail Drop puts the sales automation process firmly in the hands of the sales rep without losing the personalized touch that voicemails provide. You pre-record an unlimited amount of custom audio messages that your agents will access from their dialer software library during an active call. When the time comes to leave a voicemail, your agent will choose which custom audio message they want and ‘drops’ it into the customer’s voicemail box using only a mouse click. The system continues to run in the background and closes that particular session automatically. This is happening while your agents have already moved on to the next call in the queue. We are currently working on a smart Beep Detection feature that will actively listen in for a voicemail beep and drop a pre-selected voicemail at the end of the beep. Click HERE to watch a video clip of how Nectar Desk Voicemail Drop system works. Sales representatives are usually tired at the end of the day due to leaving numerous manual messages during the course of the day. A pre-recorded voicemail compiled after editing out background sounds and getting the right messaging produces an excellent recording. A Voicemail Drop system can save a lot of time for the sales reps. This time can then be utilized in performing other equally important tasks within the company. Its’ been reported that within high-volume sales environments, sales reps can leave approximately 150 voicemails in a single day, that’s an average of 30 seconds a voicemail amounting to over 25 hours of each individual sales rep’s time. Using Nectar Desk Voicemail Drop system will get you at least almost 80% of that lost time, which obviously translates to better sales conversions and revenue income. A pre-recorded voicemail allows sales managers to evaluate which voicemail messages bring in the most conversions. This assists them in advising their sales reps on the best voicemail recording. You can pre-record personalized voicemails based on a campaign, product or even time zones. Different wordings can then be used for these various situations to maximize message effectiveness without sacrificing that essential personal touch with your customers. A Voicemail Drop system can be integrated with your company’s CRM system consisting of metrics to assist in monitoring the effectiveness of the process. You can also use your CRM system to segment out a target group of recipients then proceed to leave a custom message for everyone in that segment with just a few clicks. Voicemail is an extremely important feature in relationships between sales professionals and prospects or customers. Voicemail Drop systems allow organisations to completely optimize the voicemail feature of customers to effectively provide them with a better customer experience. This results in increased sales conversions by their agents. The Voicemail Drop system is just one of the many contact centre solutions offered by Nectar Desk. Other innovative solutions offered by the company include Call Distribution (ACD), Cold Warm Transfers, Skills-Based Routing, Call Whispering and Call Back from Queue among others. Do you want to a free demo? Just click HERE and we shall get back to you in a short while.